I'm trying to design an alicorn, and I need help with the reference point. 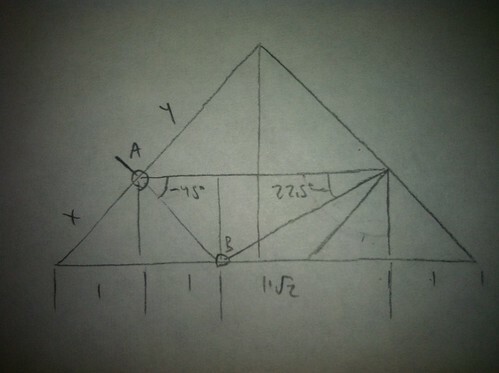 I need to find the ratio of 2:2+sqrt2 on the main diagonal, or the equivalent ratio on the edge. Basically it's so a square and a 1:1+sqrt2 rectangle can fit snugly on the main diagonal with the opposite corners lying on the edges of the square. I tried to do the math myself using a calculator, and the result was ~.5857. But when I plugged that number into ReferenceFinder, it didn't give the point I needed. Can anyone figure out what I did wrong? Also, I think this could be a good topic for anyone with a similar problem, unless the mods decide to move it. I know I've made a couple topics like this, but I can't seem to find them. I am trying to understand the point you need, but no matter how many times I've read your explanation, I can't. Can you draw a sketch (even a not-to-scale one would do)? What do you mean by opposite corners? You know that no point on the edges (I know yours falls on the diagonal) can be at a position larger than 1? Sorry if I wasn't clear. 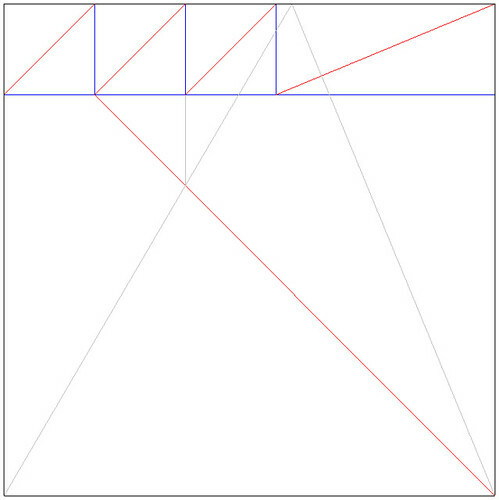 What I mean is that two corners of the rectangle lie on the main diagonal, and the other two corners lie on two adjacent edges of the square. That divides the main diagonal into divisions of 1:1:1+sqrt2:1, which can be simplified to 2:2+sqrt2. The equivalent ratio on the square's edge (I think) would be sqrt2:1+sqrt2 (if that's the result when you divide both sides by sqrt2). Let me get a model of the situation folded, and then hopefully you'll understand it better. Baltorigamist wrote: Sorry if I wasn't clear. What I mean is that two corners of the rectangle lie on the main diagonal, and the other two corners lie on two adjacent edges of the square. That divides the main diagonal into divisions of 1:1:1+sqrt2:1, which can be simplified to 2:2+sqrt2. The equivalent ratio on the square's edge (I think) would be sqrt2:1+sqrt2 (if that's the result when you divide both sides by sqrt2). I understand a bit better now, but not completely. Which side of the rectangle lies on the diagonal, the short or the long one? Still I think that a sketch (even if it is not to scale), would explain it perfectly. For (e) expand the square. Hence we have p(x,x) with x = sqrt(2)/sqrt(9 + 4*sqrt(2)) which is approaximately: 0.369398. This means that c/e = 1 - 0.369398 = 0.630602.
c/f = 0.369398/ 0.630602 = 0.585786. This is not the value that you want. In this case you are calculating how the length of (c) compares to (f). If the sketch is wrong, I at least hope this post helps you in the right direction. Last edited by FlareglooM on October 27th, 2014, 12:20 pm, edited 1 time in total. If I did the math right, x should equal about 0.4142135, or sqrt2-1. It seems my sketch was correct . I stick by my answer: x = ~0.369398 or in more exactly: x = sqrt(2)/sqrt(9 + 4*sqrt(2)). For the explenation see my post above. Yeah, you were right. I plugged 0.6306 into ReferenceFinder, and it works. Thanks a lot! I think the point you need (your point A) is 0,369398062518129, 0 The side is the one that should be of a value of 1, so you need to arrange your calculations according to that. (0.6306, 1) seems to work fine, but I might try your point as well. Thanks for the suggestion. None of the other answers were there when I saw this thread this morning but they arrived while I did my calculations he he. I don't know what all those numbers mean, but I did know the landmark for your model. valerite wrote: I don't know what all those numbers mean, but I did know the landmark for your model.